Add character and comfort to your home with accent pillow cases from Exotique Imports. 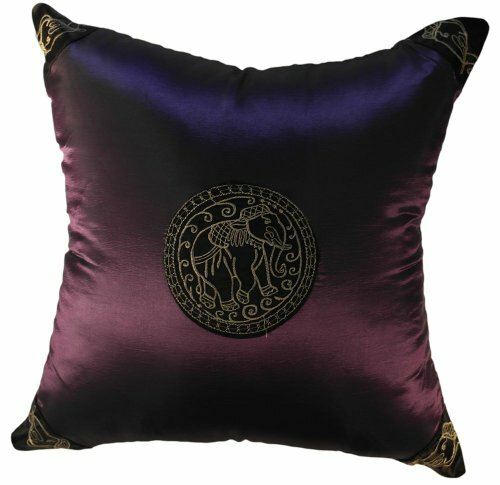 Our decorative pillow cases have unique patterns and are well made by the finest craftsmen in Asia. The pillow cases from Exotique Imports will fit with any standard 18" x 18" pillow inserts. The color matching invisible zipper will allow easy insertion and removal of pillow inserts. Redecorate your home without emptying your wallet. Please Note; ONLY PILLOW CASE/ COVER. PILLOW INSERT IS NOT INCLUDED. 18x18 inches pillow cases made from good quality Silk/Sateen in Thailand. Product DOES NOT come with pillow or any inserts. Hand wash and air dry are recommended. Convenient and neatly hidden zipper, solid color back, designed by Thai craftsman. Golden thread elephant embroidered on black silk attached at the center of solid color silk. Exotique Imports products are hand crafted by Asian craftsmen and they all are chosen by Thai owner to make sure every customers will be satisfied. You must certainly get the great quality products for you and your family. Please contact for any concerns. If you have any questions about this product by Exotique Imports, contact us by completing and submitting the form below. If you are looking for a specif part number, please include it with your message.